One of my reader Vanishree sent me this recipe few months back. I forgot to try this for a long time. When I was checking my mails few days back, I saw this recipe and thought of giving it a try immediately. As most of us know, upma is usually prepared with wheat rava/sooji. Akki tari is the Kannada name for rice rava. I had read many recipes with akki tari, but for the first time heard about akki tari uppittu. Vanishree had sent 2 variations, one was simple upma with peas(in the following recipe, exclude sambar powder and tamarind to get simple upma) and second was with sambar powder. I tried the sambar powder version because I thought it would be more tasty. See Sailu’s version of this upma. Heat oil ghee add mustard,when it starts popping, add red chillies, urad daal, chana daal,cashew nuts and curry leaves. Now add onion, chopped ginger and green chillies. Fry till onions turn slightly brownish. Add green peas, tamarind, rice rava and fry for 5-6 minutes or till the rava is well roasted. Then add boiling water(around 4 cups) and salt. Stir well and close the lid, cook on a low flame. Rice rava takes more time to get cooked. Once it is cooked add grated coconut and cut coriander leaves. PS: For idli rava – Wash and soak rice for 1/2 an hour. Drain and dry in shade by spreading over a cloth. Mill or pound till fine rava consistency. It is available in market as “rice rava” or “idli rava“. Shilpa…….I donno what is rice rava. It is something which is like idli rava we get in the Indian store, little coarse than rice flour. Looks different and interesting. Will try after buying the same from the Indian store. Thanks for a diff upma. Yes Aruna It is idli rava. I forgot to mention it. mam i would like to know by which company it is produced. Nice recipe. I’m also amused to know the kannada name for Idli rava ‘akki tari’..coooool! Also one of my friend makes chitranna from idli rava! She first cooks idli rava like rice and then makes chitranna out of it. It comes out like idli usli. Rice Ravva Upma with Sambar pwd and tamarind is an interesting combination. Will definitely give it a try. Varai is also known as Sama or vrat ke chawal. In English, it is called barnyard millet. It is gluten free too. But not made of rice. Idli rava on the other hand is coarsely grinded rice flour. Sailaja, Very happy to see you back here :D.
Sushma, try it and let me know if you like it. Gowri, din’t know the name “hurittu”. thanks :). Manjula, this is the first time I am hearing Varai. SK and NK Konkanis are totally different :(. Cool recipe…In tamil, this recipe is called arisi thari upma…my mom makes it, wanted to knw the recipe to do it now, n i got ur site on the search…real cool site, think this website will b on my favorites list!! when your blog said aayis recipes i was happy becoz i was lookingfor the batata wada recipe so was happy to find a maharashtrian version. and now i find you are from north kanara. i am from south kanara mangalore to be precise. i say to you long live the coconut cuisine. soak idli rava in water for 15-20 min. Heat oil add mustard seeds. On spluttering add methi seeds and curry patta. Now add soaked idli rava and saute after five min add salt and coconut. When it becomes upma types consistence put off the gas. After the mixture cools down a bit make small balls with a small dent in between and steam like idlis and eat with chutney and molgapoodi (south Indian orange chutney) with coconut oil. At my husbands place they sometimes have with plain coconut oil too. 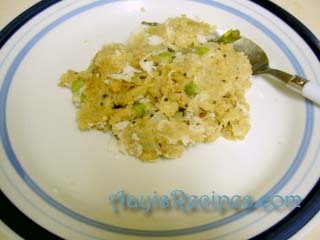 Shilpa: Shilpa, thanks, I have this recipe on the site here. Sorry i missed it. was wondering how you dint have it, hence sent it.Its a typical amchi recipe. Shilpa: Thanks for the recipe Shilpa. I really appreciate you taking time to write the recipe. No need to say sorry about it, I just replied for to help others who don’t know about it, so that they can see pictures. In ingredients tamarind is mentioned. But dont think its required in upma and also its not there in the preparation. Maybe by mistake its there in the ingredients ? Shilpa, OUr version of thsi upma is different. Coarsely grind 4 tbsp of toor dal, 1tspof both jeera and pepper(dry).Heat oil, add mustard, urad, green and red chillies, choppedgingerThis is for one cup of rice rawa. Add 2 cups of water to the tadka, and when it boils add the coconut( 1 tbsp) , hing and the rawa. Cook it for some time in the kadai and when it comes to idly batter consistency transfer to a bowl and pressure cook for 2 to 3 whisles. Pl try this and it is very easy for you to prepare aftera days hard work. Shilpa, You must be knowing that rice rawa is different from idly rawa. PL publish this in the recipe. procedure is same as other upma.But one thing is important, this upma needs lil more amount of water than the regular upma. thanks much for this recipe. My grandmother used to make it and I felt like eating it. Searched on google and your was the first hit as always. My ajji did not use veggies but it is worth a try. I agree with your comment on BF – my family also loves different breakfast options and the more to try the merrier. I love your blog and have incorporated many recipes from there into my own cooking. Thanks so much for putting this together. You have made many of my childhood memories of food possible for me to recreate in my own kitchen. Just tried this reciepe since it is one of my hubby’s favourites when his mother comes to visit and unfortunately something went wrong:-( The whole thing was mushy and not granular like upma usually is….can you tell me what I could have done wrong? “Varai” is Samo seeds.. it is used in Maharashtra for Fast food..that is Upwasa food.. we make upma out of it ..but using ground nut powder..